JOHANNESBURG (AP) — Nelson Mandela’s family is no stranger to the public eye — its successes and trials have been aired for decades in films, books and the news media. 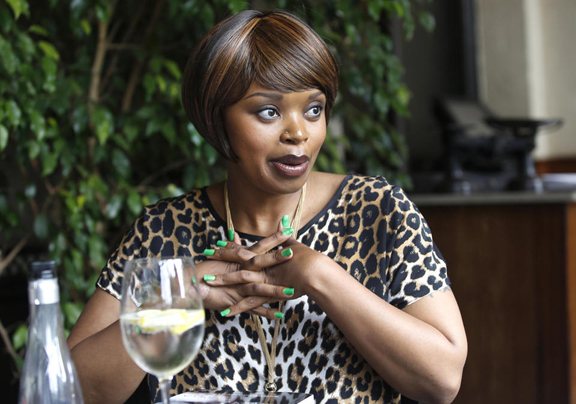 Granddaughter Zoleka Man­dela’s story, perhaps, is the one that no one saw coming. The 33-year-old launched a book in South Africa Tuesday, “When Hope Whispers,” that recounts her family’s involvement in the fight against South Africa’s white minority regime, her struggles with alcohol and drug addiction, the loss of two of her children and her fight against breast cancer. “By the time I was born, on 9 April 1980, my mother (Zindzi Mandela) knew how to strip and assemble an AK-47 in exactly thirty-eight seconds. She was twenty years old, trained in guerrilla warfare and already a full-fledged member of Umkhonto we Sizwe (the armed wing of the African National Congress),” says the book's opening line, describing her mother's participation in violent struggle against apartheid. Before she was a year old, her grandmother, Winnie Madikizela-Mandela, had already smuggled her into Robben Island prison so her grandfather could see her. Zoleka recounts a story told by her mother and grandmother of a time they said she helped her grandmother by hiding a hand grenade in her school bag, where police didn't look, though she still saw her grandmother arrested.